Just another quirky example of homeschool writing. That title, and that caption, is an experiment. See, if you type the phrase homeschool writing into Google, you will quickly be given a page of hits that I do not much like. You’ll get a whole page–and then at least part of another–with nothing more than writing curriculum. Sites that want to sell you stuff. Sites that want to teach your kids “skills” and “fundamentals.” Sites that don’t sound like much fun. I assume that any person who types homeschool writing into a search engine is looking for answers. And I’d love to have my website appear on that first page, in that clickable blue sea of curriculum, announcing something different. Fun! Alternatives! Ideas for writing centered in the child rather than directed at the child! With regular mention of superheroes! It’s not an ego thing. It’s not as if I would show up at my homeschool group park day and say, “Guess what, folks? My website hit the first page of hits for homeschool writing!” No, I just hate the idea that parents searching for writing options find little more than worksheets and textbooks and very expensive online courses. I don’t know much about SEO–although I do know that’s an acronym for search engine optimization, which is the process by which websites get ranked in search results. Higher results are tied to post titles, and the use of keywords within a post and a whole lot of other stuff which I don’t really understand. I do know that when I redesigned my blog using the Thesis framework, I was promised better SEO results, and that has actually panned out. What might happen is that my blog could pushed up to the first page of results, only to have searching parents clicking over here and deciding that I’m a little loony. But maybe not! Maybe they would click that button on the right sidebar that says writing with kids and discover a bunch of posts–and all sorts of wonderful reader comments–about writing ideas that aim to be kid-oriented, meaningful, authentic and fun. Maybe they’d click on that Dictation Project button and see that there are ways to work with kids who have lots of ideas but struggle with physical writing. Oh, and headings are supposed to be helpful. So here’s a heading about HOMESCHOOL WRITING! Well, that’s that. But since you’re here anyway, let’s chat. Why don’t we talk about…um… homeschool writing? Got any victory stories to share? Any worries or concerns about writing? Questions? Comments? This post is, by design, lacking substance. So let’s open up this baby and get to the good stuff. P. S. Homeschool writing is an odd phrase. It’s not a term I typically use–but it is the sort of thing a person types into a search engine, so there you go. If my blog ever reaches the first page of hits for homeschool writing, I will do something nice for you readers. I’m not sure what, but perhaps it will have something to do with that crazy little thing called homeschool writing. getting ready for my second young writer’s workshop this week. we do homeschool writing there. 🙂 actually, we are going to set up writer’s journals and do that activity where you have a page from a book, a sharpie marker and you mark out everything except the words you want. i can not wait. I love that writing idea, Amy! Have never tried it before, but now we’re going to! See, this is why I need to spread the word about workshops–so all you enthusiastic new folks can fill me up with new, fresh possibilities! P.S. Thinking of you as your new online adventure begins. I hope it turns out as fabulous as it sounds. This is my first comment but I’ve been reading through the archives with much interest for a few weeks. EVERYTHING you’ve said has resonated. Thank you. I’ve found the little push I needed to do what I’ve been wanting to do since the beginning of our homeschool journey three years ago. As a collector of homeschool curricula, including a myriad of writing curricula, I truly believed I needed a program to hold my hand in helping my daughter acquire necessary skills. With seemingly endless choices and every program promising tangible deliverables, it’s been difficult to resist. But, I’ve grown more and more confident that they are not needed. What I’d rather do is provide a warm, inviting, and open environment in which to allow her process to develop…the time and space to allow the flowering of her natural talents. Since my revelation and with more time on my hands to observe my daughter (since I’ve given up perusing and scheduling curricula), I’ve noticed just how much she does take pen/pencil/marker/crayon/quill to paper. There are stories and letters and lists and poems and memos and speech bubbles and her latest project: to read the dictionary and write down all her favorite “big” words and their definition….the reason: to keep them in her back pocket to unleash them when she deems necessary. That’s my girl! Again, thank you for having the courage to write what you do. I’m listening! Cassie, thank you so much for taking the time to write this. Little rewards me as much as hearing that someone is digging into my archives and gaining something from them! Curriculum is such a temptation, isn’t it? It seems to offer so much, all bound up and easy. I’m glad that you’ve been able to move beyond its siren song! Simply observing your daughter offers so much more, doesn’t it? Love that you’re noticing her taking up “pen/pencil/marker/crayon/quill to paper”–especially quill! 🙂 Her dictionary project is fantastic–it would be such a tedious thing if it had been assigned by someone else, but the fact that she’s taken it on for herself changes everything. Kids often create their own rigor. So impressive. Thank you so much for listening. And even more for contributing to the conversation. We did two new things last weekend (both gatherings), so I used that for a prompt to “contrast” (what’s different) and “compare” (what’s similar) the events. First the daughter made a list. She learned to use columns in Word. Then I urged her further with an outline: 1st paragraph–tell your reader what you’re going to talk about. Pretend you’re talking to Helen or Emma or someone who has no idea. 2nd paragraph — what was similar about each event? 3rd paragraph–what was different about each event? 4th paragraph–what did you think/feel about doing these things? Then I let her dictate. This writing practice was structured, but at least it was something recent and relevant, unlike one of the essay suggestions for grades 4 – 8 in Computer Activities: “If Martin Luther King Jr. were alive today, how do you think he would feel about race relations at our school?” (Who’s MLK Jr.? Why did he die? What did he do? What are “race relations?” “Whose school?”). Eeeeshh. That’s heavy lifting for late elementary/early middle school. I think our comparing one party to another was a better lesson. Lots of good stuff here, Jennifer! Learning to use columns in Word, helping your daughter organize her ideas, encouraging her to write to an audience of real friends, allowing her to write the actual piece via dictation. Also recognizing that a single, solid paragraph might be enough for your son. Just a thought. And you’re right: you’ll never get engaging writing from a prompt like that MLK one, unless a kid is actually enthused about the story of Martin Luther King Jr! Which she might be. But that MLK question would make much better fodder for dinner conversation, rather than a writing prompt. Then, if it seemed like a kid was fired up about the topic, she might consider writing about it. The next writing day, I assigned a word map. The only requirement: do it about something each *loves* to talk about. The results: one about Powerpuff Girls, the other about Pokemon. There was no resistance nor a blip of frustration. They turned out explanation for topics I usually don’t “get” and made them comprehensible! I can’t prove it yet–my kids are still young–but I have a hunch deep discussions feed good writing. Riding in the car generates more deep discussions than any assignment. Reading a graphic novel about Laika, the Russian space dog generated an exchange about the role ethics plays in science, how religion stands in for ethics for some (better a dogma to follow than having to reason it out) and whether a human life is worth more than another life–and if so, “why?” It took place over about twenty minutes, on the way to practice. These are ideas humans grapple with now, not just the worries of a kid barely in double-digit years. Now the rhetorical question: what kind of writing would I have received assigning “Please write about the role of religion as it applies to science, the relationship of religion to ethics, and your thoughts on the value of human life over/under/equal to other life”? HA! I’d stumble through that myself! Yes to Powerpuff Girls and Pokemon, for just the reason you point out: when kids have to explain something they care about to someone who doesn’t understand it, they want to be clear and comprehensible. It matters to them. Good for you for recognizing that. I absolutely agree with your hunch about discussions feeding good writing. 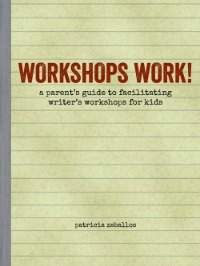 It was one of my main points in my recent article about writing: http://patriciazaballos.com/2012/05/31/how-do-kids-really-learn-to-write-2-0/ I think that we homeschoolers have discussions–like the one you had with your kids–all the time, yet we often don’t recognize how powerful and influential they are to our kids as thinkers and writers. All those comprehension questions in textbooks and prompts in writing curricula are attempting to generate that kind of thinking–but they rarely inspire the kind of passion and deep thought that a well-timed, kid-generated discussion can. We don’t need to do all that curricular “stuff” with our kids; we just need to talk to them about what interests them, and recognize how powerful those discussions really are. Did you ever see the Swedish film My Life as a Dog? Any fan of Laika would probably love it. LOL, Patricia! 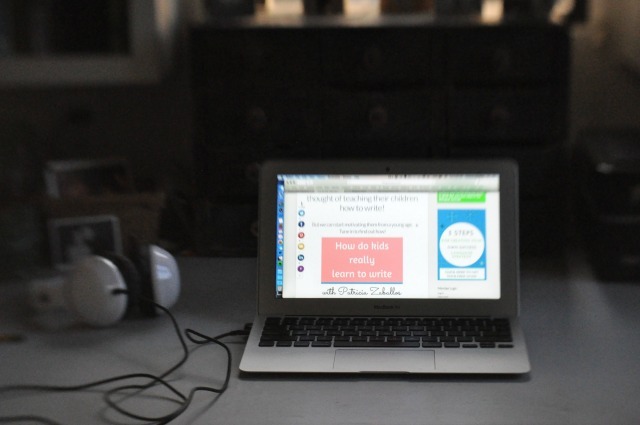 I find myself doing this very thing with the word “unschooling” – one I loathe (and have written often about that), but one that seems necessary to the SEO process. After all, there’s no point preaching to the choir as they say. Good luck getting onto the first page! we will be picking up pencils next week for writing and drawing and continuing down this life learning path with the kids. i know that i will be back here frequently for ideas on getting mine writing – you are always a source of inspiration! The inspiration is mutual, Amanda! Ok, I love so much of what you have to say about writing. My question is about the mechanics of writing. Do i need to make sure that my son (8 years old) is writing letters in the “correct” way (start at the top and draw a line down sort of thing)? I wasn’t strict about this and am wondering if it keeps him from writing more because it is a bit more difficult. Is he drawing the letters each time or is his way just as easy as the model on the handwriting worksheet? I have seen arguments for teaching correct handwriting but not much on letting go and letting him figure it out for himself. I am leaning towards pushing correct handwriting but he is not enjoying it and I don’t want to discourage his own writing. Any thoughts would be appreciated. You know, Julie, when I started homeschooling my first kid, it was following my experiences as a third grade teacher–a third grade teacher who taught cursive by walking around the room and making sure all of the kids started their lower case letters right in the middle of that dotted line… Yet when I tried to push that kind of thinking on my oldest, he rebelled. He’s a lefty, and he just had a way of writing that made sense to him, and I began to see that it wasn’t worth pushing him on it. He’s almost eleven, and he still writes with that goofy, stirring-a-pot-of-soup pencil grip! His siblings and I have gently prodded him to try holding his pencil in the conventional way, but he wants none of it. 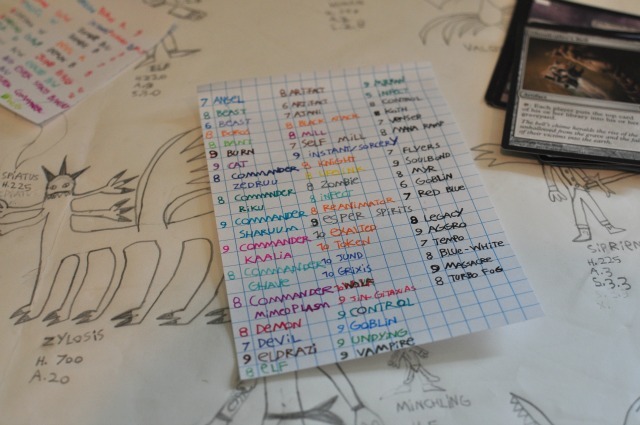 Yet, if you look at that list at the top of this post, you’ll see that he actually writes pretty neatly. Sure, his letters are unconventional: he uses all caps except for e’s and i’s. It just doesn’t matter to me. He loves to write and make lists and draw, and I’m fairly certain that any pushing and insisting on conventionality I might have done would have only undermined his love of recording his ideas on paper. And the truth is, I’m not sure those old methods of starting all letters at the top, etc. are actually the most efficient. It reminds me of how I really wanted my oldest to type properly, with his hands on the home keys. Nope, he developed his own quirky style–not hunt and peck, but not traditional either. And guess what: when my husband and I–who both took multiple typing classes in high school and have proper hand placement–challenge our kid, at 20, to a keyboarding contest, he blows us out of the water every time. He is simply faster than we are. His way works. Once, when i was despairing over my daughter’s Grip of Death on her pencil, I sat in a restaurant and deliberately paid attention to how the waiters held their pens and how they wrote. It was absolutely jaw-dropping. Not a single one had a “correct,” school-type hold. They seemed to specialize in fist grips. yet they all managed to record complicated orders legibly enough for the cooks to read them. When I got the check, our own fist-writing waiter had a lovely and rather artsy script. Thanks so much for your thoughts, Patricia! I love this post!!! I hope your blog gets in first on any google search, I am one of those mums who have looked for Homeschool Writing so many times!!! how I wish I had found you long ago. 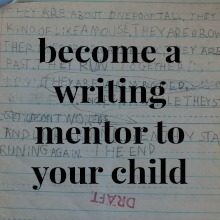 Your ideas and approach are exactly what reluctant writers like my son needs. He is slowly becoming not so reluctant! Thank you! Well, I’m glad you finally found me, with or without the help of Google. Your son is becoming a not-so-reluctant writer? That’s great news, Megan! Thank you for sharing that! It’s always so nice to see you show up here, Sarah! Love the post – I’m at the local library laughing out loud. Good luck with climbing the seo ladder because people need to be liberated around writing and this is the place to do that. A little bit of celebration at our place was that Ruby (9) got excited about writing her first story with me providing 3 words and a timer no less!! Up until then, plenty of stories, songs and performances but not interested in writing them down – not even me scribing them. And then it happened and she had that jittery, excited body language and she read it out load many times. This morning she broke into my thoughts with the first verse of a poem. Thanks for all the support while I had to sometimes sit on my hands and wait. Oh Jacinda, I’m thrilled for Ruby (and you)! Sitting on hands and waiting can be one of the hardest parts of parenting. And one of the most rewarding. Thank you for taking the time to share this with me. Stories like these really make my day. I have shared with you before how your writings have revolutionized my life with my DD9…she wrote a newspaper issue and entered a poetry contest… well now she decided to keep a journal and she wants to learn cursive handwriting. So she has this notebook that she will drag out every few days and write in it. She will sit next to me and ask me to help her spell a few words. Victory!! She is writing, practicing her spelling and handwriting without tears or fighting. Today on the way to karate she asked me when did I learn cursive. So I told her in Brazil we learn cursive first at 6 years of age. She asked me why I didn’t teach her cursive first. She is practicing her capital letters and she thinks they are so hard to form. I explained to her that here in the US they teach printing first, but that it really doesn’t matter. That handwriting is part of one’s personality so it will be distinct and unique. My DS7 is a lefty like your son and I have given him freedom on how he wants to write. Except… the other day he was copying a sentence 10 times over (part of disciplinary measures) and he kept all his words together. I pointed it out to him and just told him that if he wrote all the words without space between them we would not be able to make out each word and the whole phrase would look like one word. He promptly wrote the next sentence with perfectly spaced words. Victory! Kids are so smart… I think sometimes we just complicate things when we try to make them do things OUR way. I like your last line. So true. Be brave! UPDATE: This post has now populated into Google, and is showing up on page 6 for a search for homeschool writing. Not bad! Wonder Farm didn’t show up under homeschooling writing at all a few days ago (or at least in the first 10 pages or so), probably because I don’t have writing in my tagline or blog title, and I don’t tend to use keyword-y post titles. I prefer more lyrical titles, you know? We shall see if we can work our way higher, my friends! Meanwhile, if you’ve managed to make it here via a search for homeschool writing, a hearty welcome! Please click that writing with kids button in the sidebar, and make sure to read post comments. They’re pretty fantastic. Ooh, ooh! Checked again and we made it to page 3! Yowza! I think it must have something to do with how many people actually visit this page, so thank you, friends! I found this today on page 1. I know! The other day I noticed in my stats that a reader came to my blog by Googling “homeschool writing”, so I checked. I was gobsmacked! Now I owe you readers “something nice”! Thank you for letting me know, Dawn. Welcome! I am so glad this is all going so well. I did click over today. Good luck with getting to page 1. I’m just glad to be out there in the middle of all the curriculum. Thank you, my friend! I’m fairly new to your blog, and the first thing I encountered was “writing with kids.” That phrase alone made me certain I’d found gold. Writing curricula make me grind my teeth and tear my hair because they reduce writing to a skill practiced only in relation to academics, when the teacher assigns work. When I first began homeschooling my 5-year-old dd, I decided I wanted her to see writing as an intellectual playground, a pleasure palace of words, a means of public and private communication, a tool for remembering, and most of all, as a way to explore ideas and thoughts. I wanted her to see that writing could help her achieve her own goals. I tried not to have any expectations of what forms it would take. As the years went by, my daughter went through passionate phases: of dictating stories and songs and plays, writing letters to her favorite characters in books, keeping a house newspaper with articles about and “by” our dogs. When she was six, a crumpled piece of paper fell out of one of her pockets. In wavery letters, it spelled the name of one of her very, very favorite characters from Mrs. Frisby and the rats of Nimh. She carried it around with her for weeks. I would never have known about it had it not fallen from her pocket. We also used writing to make a huge variety of “Wanted” posters for literary criminals, making treasure hunt clues, writing museum display cards, making backyard carnival signs. All these things were thought up by my daughter, not by me. I scribed for her for many years, but gradually she took over making these things her self. The hardest years were the ones from about 6th to 8th grade, when it seemed as though her childhood creativity was drying up, and the only writing she did voluntarily was the making of endless lists. During these years she was attending a co-op, and doing assigned writing. Some of it she enjoyed a lot, but I was really sad to see the change from child-initiated and joint social writing to school assignments. When she was fourteen and back at home, she began copying endless quotations from favorite novels, so I bought her a fancy notebook and a set of pens and showed her examples of commonplace books. She took to with gusto, writing nearly fifty pages of quotes over a couple of months. During this time she suddenly became able to punctuate and capitalize correctly after years of some pretty severe dysgraphic struggles. Now, at 16, she likes to have us think up writing projects we do together — not necessarily the same assignments, but working together companionably side by side, pausing to read one another what we’ve got. Recently she wrote a preface for Lord of the Rings in the character of Sauron, while I wrote a review of a BBC production of Pride and Prejudice. She’s also taking her first community college class and writing weekly pieces for the class discussion boards. When she took two different exams to be able to register at the community college as a regular student (not a dual-enrolled high schooler), she had to take her first timed essay exams. I presented the timed essay as an academic game with certain allowed “moves.” She did exactly one practice test, and despite her high levels of anxiety (she has Asperger’s syndrome and a mild anxiety disorder), she had a whale of a time at the test itself, to the point I was quite stunned. She said she could imagine “a menacing voice” reading it aloud as she wrote, accompanied by “mysterious organ music.” She came out of the exam room laughing. When we got the results, on each test she topped out in the writing score. This has made me wonder whether, for a good number of kids, part of the problem they face is the unnecessary seriousness with which all writing is presented to them by teachers and curricula, its detachment from ordinary life, from regular speech and thought. Writing is somehow made more formal and unfamiliar to them, and more is at stake. Every time they pick up a pencil they’re going to be graded and evaluated. Who wouldn’t quail under these conditions? Who wouldn’t learn to dread writing? I think your “writing with kids” focus is one of the best ways to overcome this artificial barrier between kids and paper. May you continue to move up the google ranks! Karen, so nice to meet you here! Exactly. Exactly! It’s crazy to me how much educators can complicate writing, and separate it from life, when it really should be a natural part of how we communicate, right up there with talking. I love all the wonderful examples of your daughter’s writing over the years. (It’s so helpful to me to hear a wide range of real kid examples as I write my book.) Your daughter’s preface to the Lord of the Rings from the perspective of Sauron sounds inspired! No writing prompt could ever come close to something so juicy. And the fact that you write alongside her is so wonderful, so valuable. Hope you’ll keep reading along, and sharing your experiences, Karen. I know that many newer homeschooling parents are encouraged by stories like yours. We’ve been creating poems using words written by each child (there are three able to write and one that I write for) the inspiration was autumn, and the words linked to things we liked or disliked or simply associated with the season. Then we decorated a large A3 sheet with leaves and autumnal things and stuck the words into an order, thus creating a very unique poem that greets everyone as they come in through the door. We are unschoolers too, although I also really dislike the term! Life learner is so much more accurate. Love the poem idea, Kelly! It can be so fun to write as a family. Sounds lovely. And putting it near the door assures that it finds an audience! Thanks so much for the kind words, and for taking the time to share what you’re doing. I just wanted to say thanks for sharing today! I can’t wait to use this with Sofia and Miles this year! I love reading your ideas and thoughts on writing with kids. Always so inspiring! Thanks so much for taking the time to respond here. I’m glad the workshop was helpful! I think some parents balk about helping their kids in such a way. Your enthusiasm is likely to make the process enjoyable for all of you. Hope you have fun with it! Besides that, I have a couple of lovely stories to share, from my least-typical child. One of my favorite examples of her using writing to communicate was after we had had quite a fight — over something I don’t remember. She crept into the kitchen, and stuck a folded piece of paper into my pocket. I assumed it was a contrite note, and smiled at her with my “loving mother” face. This child loves to do “reports.” Since she’s 7, her reports consist of her going online and finding appropriate information for the subject — most often, but not always, animals. She then opens up a document in Google Docs, and cuts and pastes pieces of the information into her document. Eventually, she asks me to print them, and sometimes I can get her to read them to me — a daunting task, as they’re usually about 4-5 pages long. But it’s so cute, I can’t stand it. Her siblings have almost been broken of the habit of announcing that it’s “not writing, it’s just copying,” because I have threatened them. Also, I occasionally point out that at 7, it’s accurately called writing in my book. Eventually she will begin to digest the material before she writes it, but for now she can tell you all kinds of information about habitats, buffalo, mammals that lay eggs, etc. All from “writing” it down. The most recent report is on narcolepsy, because we were reading Emmy and the Incredible Shrinking Rat, and one character has “ratolepsy,” so I told the kids about seeing a film in school about beagles bred to have narcolepsy, what the disorder was, and what it did. She got pretty fired up about it. And for your stats? Homeschool writing, homeschool writing, homeschool writing, homeschool writing, homeschool writing. Ha! Gotta love that note. I hope you saved it. I’m glad the sibs have been almost broken of their announcements. Because if a kid wants to play with text like that, of her own accord, she’s certainly learning something from it, as I know you realize. Doing online research at seven is a pretty fantastic thing as it is, not to mention all the sentences she’s reading, and pasting, and reading again. My firm belief is that if kids are compelled to do something again and again, they’re learning something from it. And I know that as a college English instructor, you will not lead her wrong when it comes to plagiarism. Eventually. Please start that young writer’s group! I often find myself thinking of you these days as I watch my son take his first steps into independent writing–through Minecraft. There’s the chat feature when he plays on an online server with other kids–real time communication and problem-solving and in some cases working out interpersonal disputes–all through writing. He’s also been building obstacle course-like mazes in Minecraft with puzzles and clues that have to be worked out, so he writes text for many different signs posted around his mazes. His signs are often full of cheeky little jokes and ribbings toward the people who will eventually try to work their way through his obstacles. His writing still doesn’t look anything like school writing, but I take encouragement from what I’ve read here on your blog that there’s value in it nonetheless. His writing may not look like anything he’d be doing in school, but the way he’s using his writing actually looks quite a bit like the kinds of writing I do every day (working out problems and questions with other people via email, writing instructions or explaining details for events or classes I’m helping to plan). It’s interesting, actually–I hadn’t made that connection between his writing and mine until just now. I’m tickled to see that you were right a year or so ago when you reassured me that he would find his way into writing. It’s not the path I would have chosen for him or been able to anticipate, but there it is. So great to hear, Carrie! I especially appreciate your insight that your son’s writing is more like the actual writing you do on a daily basis than it is like traditional school writing. That’s a compelling thought! So much school learning is based on goals that educators and administrators set decades ago, and has little value in everyday life. Your son’s writing, however, is driven by authentic, real-world activities. How can it not be valuable? To both what he needs now, and what he’ll need in the future! Thanks for sharing this, Carrie. Now when parents come here for reassurance, I can point them to comments like yours to give them a sense of what a kid’s writing path might look like. Oh, one more way my son was inspired to write by Minecraft–he had an idea for a type of world he wanted to build on Minecraft with a friend of his, with lots of challenges and obstacles for the other kids on their server. Dictating to me, he sent his friend several detailed, step-by-step emails about what they’d need to do to build this world and what would be included in their world. When I was teaching college composition, we called what he did in his emails a process essay. The amazing thing was that he got the hang of process-writing without any instruction from me, simply because he had a clear audience in mind and a clear purpose for his writing. So freaking fabulous! Freaking fabulous it is! Again, more evidence that we don’t need to assign abstract requirements like process essays to kids. Kids who are engaged in meaningful work will engage in meaningful writing. It’s as simple as that. There’s so much that we don’t need to *teach* kids, if we provide them with rich opportunities, and are there to support them. The Minecraft server was one that had already been set up by some friends of ours, and I felt absolute trust in the kids on the server and their parents. I really like that it’s kids we actually know and that their interactions with each other are generally supportive, encouraging, and kind (aside from the occasional spats when one kid “cheats” in some way or when one player accidentally clouts another one in the heat of battling Zombie Pig Men). It has been a really good experience for B. Thanks, Carrie! I’ll have to look into setting something like that up for T.
Haha! Literally LOL at the repetitive phrasing for SEO. Sounds like a winner to me. (Inquiring minds will want to know, did it work? did it?) 😉 BTW – their handwriting is so neat! Well, since you asked, Susan, I’m happy to report that when I checked yesterday, this post appeared on Google’s first page of hits for “homeschool writing”! I only thought to check because I noticed on my stats page that someone had actually found their way to my site by googling “homeschool writing”. I am happy to be an alternative on a Google page listing lots of formal curriculum. But I did promise you readers “something nice” if this post ever hit page 1. Will have to think on that!